This Agreement states the Terms and Conditions under which you may use the weddingbandsdesign.com website. If you do not agree with these Terms and Conditions, you should not to use this website for any purpose. "We", "us ", or "our" means weddingbandsdesign.com and "you" means you, the user of the website. 2) About our wedding bands. With every order you place with us, your wedding band is individually designed for you! Our wedding bands are made in solid 14 Karat yellow gold, 14 Karat white gold, 18 Karat yellow gold, or 950 Platinum. All our wedding bands are carefully inspected and stamped with the quality mark of the precious metal. These bands are of the highest craftsmanship quality on today's market, and we stand behind this quality for every single wedding band we make. 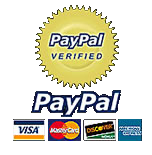 For online purchases we use the PayPal checkout system. PayPal accepts and processes all major credit cards; a PayPal account is not necessary to utilize its payment services.. We do not collect or store any of your credit card information, however, we do store and collect your name, address, shipping address, e-mail address, and telephone number. We do not share or sell this information with any other party except when required by law. We only ship to addresses in the USA and only to the verified shipping address of the credit card holder (the address used for shipping must be the same address registered with the credit card). We do not ship to PO Boxes! To ship to a different address, please contact your Credit Card Company and add an alternative address for your credit card prior to placing an order on our web site. We ship only via USPS priority mail and our packages are shipped with delivery confirmation, signature confirmation, and insured . If you are not available at the time of delivery, USPS will notify you of your options to claim your package. We offer free shipping for all the orders placed on our website to all 50 states of the USA. Since every wedding band is a unique order, we require up to 7 business days before we expect to have the order shipped. Additional days is required for delivery by priority mail service. When your wedding band is shipped, we will e-mail you the tracking number for your shipment so you can track your package on USPS website at: http://www.usps.com/shipping/trackandconfirm.htm . Please plan your purchase to ensure that you will receive it in time for your event. We are not responsible for any delays which may occur in the process of ordering and shipping your wedding band, and you agree to not hold us responsible in any way for such delays. If, for any reason, you are not satisfied with the wedding band you have purchased from us, we offer a 30 day return policy for exchanges or refunds from the date we shipped your wedding band.If you want to return your item for a refund or exchange you must first obtain a RMA (Return Merchandise Authorization) number. To receive your RMA number, you must contact our Return and Exchange department at: returns@weddingbandsdesign.com . We will provide you via e-mail with a RMA form. Print this form, fill out all the fields in the form and mail this form to the specified address on the form. Do not return any merchandise to the RMA address! Any merchandise returned without obtaining fist the RMA form ,will be refused and returned by the USPS services. Our Return and Exchange Department team will process your RMA within 3 to 5 business days and we will email you instructions for your return .Please follow these instructions carefully; FAILURE TO DO SO WILL VOID YOUR RETURN RIGHTS. To qualify for return, all merchandise must be returned to us in the original condition and under the following guidelines: unaltered; resized; engraved; or with any visible marks, dents, or other visible damage; in the original gift box; with the original receipt/invoice; with all the original materials and documents we initially shipped to you; and, with the security tag intact without attempts or actually being removed from the wedding band. Do not remove the security tag from the wedding band! REMOVING THE SECURITY TAG WILL VOID YOUR RETURN RIGHTS! You can try your wedding band on your finger with the security tag on, since the tag is very thin it will not change or affect the size of your wedding band. Wedding bands returned to us without our original security tag, or with the security tag removed or tampered with, will not be accepted for refund or exchange and they will be shipped back to you at your expense.Custom designed wedding bands are not eligible for return or exchange. After receiving the returned merchandise from you, our team will inspect the content and the condition of the returned items and will authorize the refund or exchange. Any wedding band that is returned under the following guidelines will be accepted and authorized for return. In the case that the refund is authorized, providing that you returned the item in the condition stated above, your refund/exchange will be processed in the next 5 business days. Returned items must be shipped back to us using USPS services, priority mail, with delivery confirmation, signature confirmation, and insurance. Do not use other labels. Packages having a different label and/or without RMA number will be refused and returned to you by USPS. Returned merchandise will be credited to your credit card (the same one you used for purchasing your item), less the amount of all shipping costs. We will inform you about the status of your return via e-mail. In the event that your item is not eligible for a return/refund, we will inform you in writing within 3 to 5 business days about the reasons we declined your return/refund. You must respond to our letter within 20 days and let us know if you want your item sent back to you. If you do not respond within 20 days from the date you received our letter, the item will become property of weddingbandsdesign.com and you forfeit all ownership rights to that item. If you request your item to be shipped back to you, we will do so at your expense. All packages are shipped in the same manner as with the original purchase. For exchanges we will apply the difference in cost between the first ordered item and new ordered item and we will charge for the shipping costs; . If the return was due to our error, and in this case only, we will offer free shipping for the exchanged item the cost difference shall be credited or charged, whichever is appropriate. Credits or charges resulting from an exchanged product must be made with the same credit card used for the initial order. Weddingbandsdesign.com reserves the right to change this agreement without prior notice. We have attempted to be as accurate as possible in representing pictures of our products, however, some small differences may exist between the wedding bands pictured on our website and the actual products. Some of these differences may be caused by the computers screen’s settings, light conditions, the angle the picture was taken from, and other conditions. You agree not to hold us responsible for such inaccuracies. Prices are subject to change without notice and at sole discretion of weddingbandsdesign.com. In addition, we reserve the right to refuse any order from any customer at our sole discretion.